WWII hero Samuel Gable has weeks to live. Eighty-eight years old, his body ravaged by cancer, he's full of unrest for reasons that have nothing to do with the horrid disease. He has secrets to divulge, and local writer Pete Swift agrees to document what he assumes are a few tales... read full description below. WWII hero Samuel Gable has weeks to live. Eighty-eight years old, his body ravaged by cancer, he's full of unrest for reasons that have nothing to do with the horrid disease. He has secrets to divulge, and local writer Pete Swift agrees to document what he assumes are a few tales of war. As Samuel recalls perilous days spent in the jungles of the South Pacific, however, Pete begins to live vicariously through Samuel's stories. A kinship grows as the saga moves from the deadly battlefield to one of the great love stories of all time, as Samuel recalls his love affair with Callie, the dark-haired beauty he fell in love with before being shipped off to war. 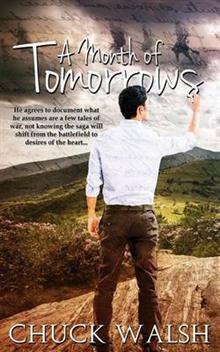 Samuel's stories weave the past and the present, and the reasons for his unrest begin to unfold. Pete comes to learn that Samuel's son, Caleb, left home abruptly thirty years ago due to a tragic accident that ripped the family apart. Meanwhile, Pete finds himself drawn to Samuel's daughter, Gabby, who moved back home to take care of her dying father. With Pete, Gabby has a shoulder to cry on and a diversion from the impending death that awaits her father. Their chemistry sets up a passionate collision course that threatens to undermine Samuel and Pete's relationship, not to mention Pete's marriage. Both Samuel and Pete are burdened by situation and circumstance, but for entirely different reasons. Set in a backdrop of the Blue Ridge Mountains of Tennessee, these unlikely friends are in a race against time to heal the wounds of their hearts.